The other day after work and school, I put Lou in her exersaucer on the porch. Set up The Phi with a snack and a coloring book on the porch and I mowed the lawn. I thought "it's good for them to see their Mom do these kinds of things". To see thier Mommy working hard. To know that Mom is not a delicate flower but is capable of getting things done! Recently I wrote about how my parents built the house we grew-up in. During that time that they built the house my perception of my Mom changed. I had always seen my Mom and just that, a Mom. She was the best kind of stay-at-home Mom. Always there to play with us, read with us, sing to us, help us with projects, feed us and love us. Then they built the house and I watched my Mom put up walls, nail shingles to a roof, landscape, pour cement, paint. And at just about 5 feet tall she's a petite thing! I watched her work just as hard (sometimes harder) than the men on their team. She would leave in her work clothes and come home dirty and sweaty and happy. When we moved into the house my Mom was no longer just that awesome Mom who loved us and spent her days taking care of us. 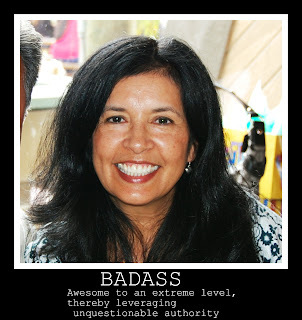 My Mom became a "badass". She was strong and capable of anything. I mean the woman helped build a house. And not just picked carpet color. But build a house. Today I know my Mom can do anything.